stickman's corral: Are there any four-minute miles in economics? The claim that a 4-minute mile was once thought to be impossible by informed observers was and is a widely propagated myth created by sportswriters and debunked by Bannister himself in his memoir, The Four Minute Mile (1955). The reason the myth took hold was that four minutes was a nice round number which was slightly better (1.4 seconds) than the world record for nine years, longer than it probably otherwise would have been because of the effect of World War II in interrupting athletic progress in the combatant countries. I was reminded of this yesterday, as my Twitter and Facebook feeds were flooded by excitable and angry complaints about the Dollar-Rand exchange rate breaching the symbolic threshold of 1:10. Now, to be sure, the Rand is at it's weakest level for several years following a number of social upheavals, government scandals and political infighting, questionable economic policy, and wider trends in emerging markets. (Here, here and here for more context.) 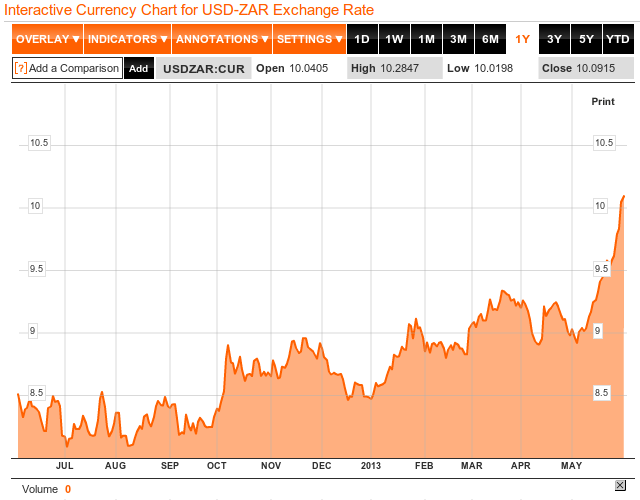 I should also say that I am not endorsing a "weak Rand" strategy here in any shape or form. I am, however, interested in the question of whether a 1:10 exchange ratio is significant in of itself. 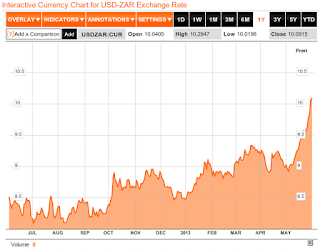 Moving beyond the case of the USD-ZAR exchange rate, the notion of thresholds pervades much of economics and finance... Or, at least, it pervades talk about economics and finance. Consider, for example, some of the headlines from recent weeks concerning the fall of gold prices to below $1,500 and then $1,400 per ounce... or the brouhaha surrounding that Rogoff-Reinhart paper and their fabled elusive "90 percent" cut-off rate for debt-to-GDP ratios and its supposedly dire consequences on economic growth. Valuations should ultimately be set according to economic fundamentals. These would not be much different for a stock or trade that is valued at, say, R9.90 versus R10.10. An alternative reason is that traders don't target levels per se. Rather, they target the levels implied by momentum and trend lines (with predefined margins of safety), or algorithmic strategies (which are similar in principle). There's no a priori reason to think that these implied levels will accord to nice round numbers. Let me end this post by saying that I haven't bothered with any kind of literature research; I'd be interested in hearing about studies investigating this type of phenomena. Alternatively, if not much has been done and someone is interested in looking at it further... drop me a line. Two possibilities for checking the existence of "four-minute mile" numbers is that they should act as focal points or thresholds. For the former, we would expect data to bunch around particular levels from both above and below. For the latter, we would expect a discontinuity in the rate of change for a particular stock or currency valuation (i.e. once a threshold is breached). Several ways of testing this empirically immediately spring to mind. This is off-topic, but have you seen or read any of the following articles that have some connection to your specialty of environmental economics (the following references are in Chicago style)? Rose, Adam, David Kolk, Michael Brady, and Robert Kneisel. "Energy development and urban employment creation: the case of the city of Los Angeles." Energy 6, no. 10 (1981): 1041-1052. Brady, Michael. "On the choice of optimal energy options at the City-metropolitan level." Energy 9, no. 2 (1984): 183-187. Brady, Michael. "The relation of acid rain to energy policy." Energy 10, no. 10 (1985): 1113-1118. Brady, Michael E. "Solar power subsidization." Energy 12, no. 1 (1987): 67-73. Brady, Michael E. "Stability and sustainability of modern chemical farming: a viewpoint." International Journal of Environmental Studies 33, no. 1-2 (1989): 53-58. Brady, Michael E. "The role of risk assessment and the rate of discount in benefit‐cost analysis: modeling irreversible energy externalities." International Journal of Environmental Studies 35, no. 4 (1990): 245-251. Brady, Michael E. "A theoretical analysis of the environmental effects of lead contamination over time on IQ, education and crime in America: a viewpoint." International Journal of Environmental Studies 44, no. 2-3 (1993): 189-201. No, I haven't read any of those articles, unfortunately. Most of the them were written before my time -- at least in an academic sense -- and I suppose not as well known as some of the older, "classic" papers that have persisted in the literature. I might take a look at one or two of them, however, when I get time. I see. Which of the articles I have shown you seem the most interesting? Acid rain and one on risk assessment, discounting and irreversibility. I see. Will you look any of the articles up on a search engine in the near-future?